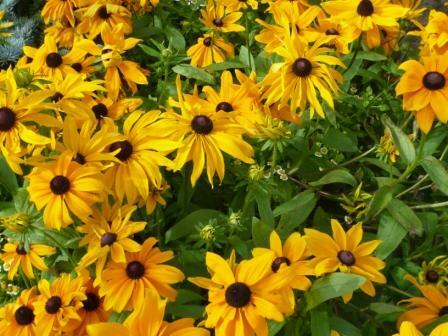 These Rudbeckia are grown as annuals or biennials but great perennial varieties exist. Some grow as low as 12 inches whilst Rudbeckia triloba Brown Eyed Susan is 5 foot tall and Rudbeckia maxima can be up to 10 feet tall. Rudbeckia are easy to raise from seed. Resulting plants are well behaved, easy to care for and flower from August until late Autumn. 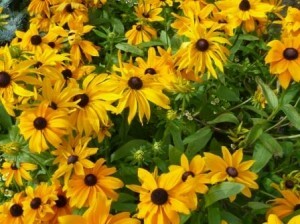 There are many varieties of Rudbeckia and I recommend hirta and fulgida types. 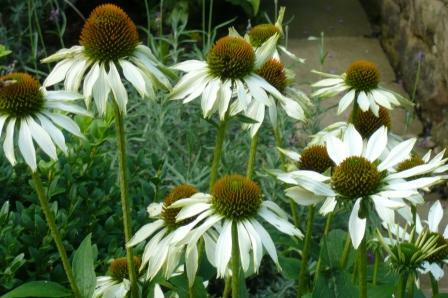 Rudbeckia sullivantii ‘Goldsturm’ and ‘speciosa’ both around 2 foot tall have the RHS Award of Garden Merit. The ‘Green Wizard’ below is under test.